Background An athlete's intention to return to sport following anterior cruciate ligament (ACL) injury is a major indication for surgical intervention. Purpose The purpose of this review was to determine postoperative return-to-sport outcomes after ACL reconstruction surgery. Methods Electronic databases including Medline, Embase, SPORTDiscus and CINAHL were searched from the earliest possible entry to April 2010. Studies were included that reported the number of patients returning to sports participation following ACL reconstruction surgery. The results were presented using the World Health Organization's International Classification of Functioning, Disability and Health as a framework and combined using proportion meta-analyses. Results Forty-eight studies evaluating 5770 participants at a mean follow-up of 41.5 months were included for review. Overall, 82% of participants had returned to some kind of sports participation, 63% had returned to their preinjury level of participation, and 44% had returned to competitive sport at final follow-up. Approximately 90% of participants achieved normal or nearly normal knee function when assessed postoperatively using impairment-based outcomes such as laxity and strength, and 85% when using activity-based outcomes such as the International Knee Documentation Committee knee evaluation form. Fear of reinjury was the most common reason cited for a postoperative reduction in or cessation of sports participation. Conclusion The relatively low rate of return to competitive sport despite the high rates of successful outcome in terms of knee impairment-based function suggests that other factors such as psychological factors may be contributing to return-to-sport outcomes. The anterior cruciate ligament (ACL) plays an important role in maintaining knee-joint stability, primarily through limiting anterior tibial translation on the femur and restraining rotation, but also by resisting varus and valgus forces at the knee.1,–,3 The ACL is commonly injured via a non-contact mechanism during sports participation, particularly in sports involving jumping, pivoting and cutting manoeuvres.4 When surgical reconstruction is performed, typically a graft is harvested from the patient's patellar or hamstring tendons and is inserted into femoral and tibial bone tunnels to replicate the native ACL. It has been suggested that patients aiming to return to their preinjury level of sports participation should undergo ACL reconstruction in order to maximise recovery, particularly those active in organised competition or pivoting sports.5,–,7 The aim of the surgery is to maximise stability and functional capacity in the ACL-deficient knee,8 9 thus facilitating a return to preinjury activity levels and sports participation. Information regarding the rate of return to preinjury sports participation level following ACL injury and surgery is limited.10 A previous literature review reported that 56% of patients who underwent ACL reconstruction returned to their preinjury level of sports activity.11 This was despite a much higher proportion of patients achieving satisfactory surgical and functional outcomes assessed with physical measures such as single limb hop for distance, isokinetic muscle strength and anterior knee laxity. It was further suggested that the discrepancy between satisfactory physical outcome and the return-to-sport rate may point to a role of psychological factors in determining return-to-sport outcomes.11 12 The Kvist11 review, while informative, was not a systematic review and only included 15 studies published in a 5-year period between 1998 and 2003. The author did not report the search strategy used to identify the reviewed literature and did not undertake a quality assessment of reviewed studies. As a result, the findings may not accurately reflect a return-to-sport outcomes following ACL reconstruction. Kvist11 also raised concerns about the reporting of comparisons of postoperative sports participation with presurgery (but postinjury) status as a measure of successful return-to-sport outcomes. Feller and Webster13 suggested the use of preinjury sports participation levels as a baseline comparison for return to sport, as it provides a more rigorous comparison. This is because previous work has shown presurgery sports participation levels to be lower than preinjury levels.14 Therefore, comparing postoperative sports participation to presurgery levels rather than preinjury levels may not be a valid method of evaluating the effectiveness of ACL reconstruction surgery. The World Health Organization's International Classification of Functioning, Disability and Health (ICF) was introduced in 2001 in an attempt to streamline the description of functional states associated with health conditions.15 The ICF framework provides a means for consideration of the impairments of body structure and function, activity limitations and participation restrictions arising from a particular health state when evaluating health outcomes. The impact of contextual factors, namely environmental and personal factors on function, is also considered. Assessment across the domains of the ICF is encouraged when evaluating health and disability outcomes.16 The ICF framework provides a succinct framework within which to assess the effectiveness of ACL reconstruction surgery in facilitating a return to participation in sport, as it considers all aspects of the rehabilitation process. This systematic review was undertaken to build upon previous work by Kvist11 and to evaluate all available literature using rigorous outcome measures to determine a return-to-sport outcome. Annually, approximately 100 000 ACL reconstructions are reported to be performed in the USA.17 Given that many ACL reconstructions are performed to facilitate a return to sports participation, knowledge of the success of surgery in terms of enabling athletes to return to sport postoperatively would assist clinicians in counselling patients regarding the choice between conservative and surgical management. Therefore, the aim of this review was to determine postoperative return-to-sport outcomes after ACL reconstruction. The ICF was used as a conceptual framework within this study for evaluating the return-to-sport outcomes. Relevant articles were identified following a search of the electronic databases Medline, CINAHL, Embase, PsychInfo, SPORTDiscus, The Cochrane Library, AMED, AMI, AusportMed, PEDro and Meditext. Database entries were searched from the earliest reported date (January 1950 for Medline) to April 2010. Search terms were mapped to relevant MeSH terms or subject headings where possible. Search terms were entered into the database under two concepts: Concept 1—‘anterior cruciate ligament,’ ‘anterior cruciate ligament reconstruction,’ ‘anterior cruciate ligament autograft,’ ‘orthopaedic,’ ‘knee joint’; Concept 2—‘return to sport,’ ‘sport re-entry,’ ‘athletic,’ ‘sport,’ ‘sport participation,’ ‘physical activity’. Keywords in each concept were grouped with the OR operator. The results from each concept were then combined with the operator AND to produce the search strategy and the final yield. To supplement the electronic database search, the reference lists of relevant papers were also cross-checked. Forward citation tracking was also conducted via the electronic database Web of Science. This supplementary searching was undertaken in order to identify any further relevant articles not found on the initial electronic database search. Publication details from all studies identified in the literature search were exported to bibliographic software. The following inclusion criteria were applied to the final yield: return-to-sport data presented for people following ACL reconstruction, number or percentage (or data allowing calculation) of people returning to sports participation following rehabilitation reported and English-language report. All criteria must have been satisfied in order for inclusion for review. Review studies were excluded. Data reported for return-to-sport outcomes in subjects with ACL-deficient knees were disregarded, as this review aimed to identify evidence applicable to subjects following ACL reconstruction. All studies reporting a return-to-sport outcome following ACL reconstruction surgery were considered for inclusion in this review regardless of the type of graft used in the surgery. Studies were limited to English-language reports owing to translation costs. When applying the selection criteria, the title and abstract of each study were first reviewed. Where it was not clear from the review of the title and abstract whether a study was appropriate for inclusion, the full text of the article was examined. Two reviewers applied the selection criteria independently. Consensus was used to resolve any disagreements between reviewers, with a third reviewer consulted if consensus was not achieved. The studies included were assessed using a six-item checklist developed specifically for this review. Specific items were adapted from two previously published quality assessment scales for evaluating non-randomised studies,18 19 and combined with items specifically developed to be applicable to this research area.20 21 The six items assessed were: selection criteria described, representative population selected, participants' preinjury sports participation level reported, data collected prospectively, demographic data reported and postoperative sports participation level compared with preinjury level. Items were scored as follows: one point for satisfaction of the criterion, no points for not satisfying the criterion. A score of zero was given if it was unclear whether the criterion had been satisfied or not. All articles were assessed independently by two assessors, with disagreements resolved by consensus. The purpose of the quality assessment in this meta-analysis was to identify characteristics of study quality and design common to all included studies, and provide a qualitative description of these characteristics in the meta-analysis. Data were obtained from each study using a data-extraction form developed specifically for this review. Data were analysed using the Statistical Package for the Social Sciences version 17 (SPSS Science, Chicago) and StatsDirect (Altrincham, UK). The primary outcomes of interest were the number of participants returning to any sport regardless of the level of participation following ACL reconstruction, the number returning to their preinjury level of sports participation and the number returning to competitive sports participation. Data regarding return to any type of sport were recorded as dichotomous outcomes, as returned or not returned to sport. Data regarding the rate of return to any type of sports participation, the rate of return to preinjury sports participation level and the rate of return to competitive sport were combined via a proportion meta-analysis using a random effects model.22 23 The I2 index was used to measure the amount of inconsistency in the results of the included studies.24 A larger I2 index indicates that a greater amount of the variability in the results is due to heterogeneity rather than to chance.25 The mean and 95% CI were calculated for return-to-sport rates. 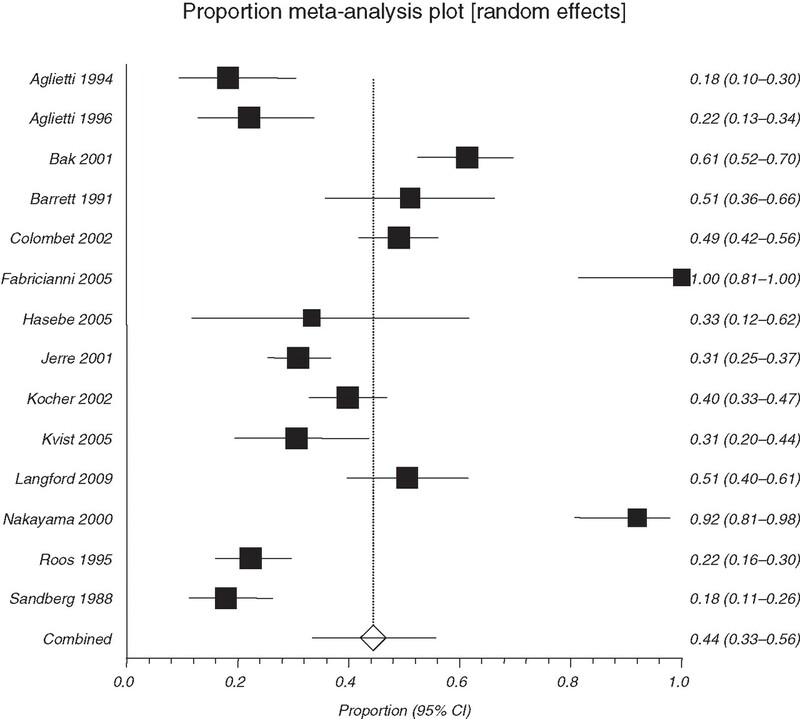 Studies included in the meta-analyses were weighted according to sample size. Return-to-sport rate data from individual studies in addition to the pooled return-to-sport rate was presented in forest plots. Return-to-sport data from studies that did not explicitly state the number of participants returning to preinjury or competitive sports participation were combined via meta-analysis to determine the rate of return to any sports participation postoperatively. The secondary outcomes were the International Knee Documentation Committee (IKDC) classification, knee laxity, hop test and thigh muscle strength. The percentage of participants with knees classified as category A or B according to the IKDC form was calculated. Arithmetic averages were calculated for knee laxity, and the limb symmetry index for hop tests and muscle strength tests. Subgroup analyses were completed to examine whether there were any differences in return-to-sport rate depending on the year the study was published, and whether there were any differences in return-to-sport rate depending upon the length of follow-up of return-to-sport outcomes. It was hypothesised that older studies may have reported a lower return-to-sport rate when compared with more recent studies owing to advances in surgical technique and postoperative care and rehabilitation protocols. Studies with too short a follow-up period may skew the results. For the subgroup analysis, data regarding the rate of return to any type of sports participation, the rate of return to preinjury sports participation level and the rate of return to competitive sport were combined via proportion meta-analysis using a random-effects model. For the purposes of the meta-analysis, the year of study publication and length of follow-up were dichotomised. Studies published up to but not including January 2000 were grouped (pre-2000 group) and studies published between January 2000 and April 2010 were grouped (post-2000 group). The year 2000 was used as a cut-off as a pragmatic decision, as this divided the studies into roughly equal groups. For the second sub-group analysis, studies with a follow-up of up to 24 months were grouped (<24 months group), and studies with a follow-up period of 24 months or greater were grouped (≥24-month group). Weighted mean averages were calculated for participant age and length of follow-up. Arithmetic averages were calculated for clinical evaluation data in order to provide information regarding the surgical and rehabilitation outcome. A p value of ≤0.05 was considered significant for all statistical analyses. The literature search yielded a total of 942 articles. Subsequently, 874 articles were immediately excluded, as they did not fit the criteria for review. Copies of the full text of the remaining 68 articles were examined, as their appropriateness for inclusion could not be determined following a review of the title and abstract. Twenty of the 68 full text studies were excluded. Fifteen studies did not report the number of people returning to sport postoperatively,6 26,–,39 two studies reported return-to-sport outcomes for ACL-deficient populations,40 41 one study reported return-to-sport outcomes for participants who had undergone ACL repair42 one study was a review paper,11 and another study was subsequently withdrawn from publication.43 Forty-eight studies were included for full review. A summary of the populations examined, the return-to-sport outcome measures employed and focus of each study are presented in table 1. Overall, a total of 3163 participants were reported to have returned to some form of sports participation at final follow-up. The pooled return-to-sport rate from meta-analysis was 82% (95% CI 73 to 90%, I2=98%) (figure 1). Thirty studies reported the number of participants returning to sport at their preinjury participation level. The total number of participants returning to their preinjury sports level was 1421. The pooled rate of return to preinjury level from meta-analysis was 63% (95% CI 54 to 71%, I2=95%) (figure 2). Seventeen studies reported the number of participants returning to competitive sport. In total, 580 participants had returned to competitive sport at a mean of 36.7 months postoperatively. 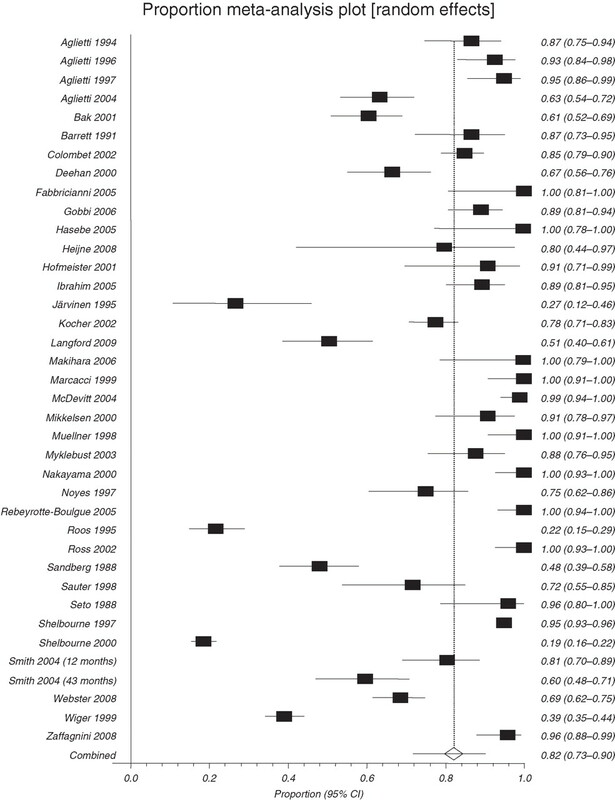 The pooled return to competitive sport rate from meta-analysis was 44% (95% CI 34 to 56%, I2=95%) (figure 3). Forest plot of rate of return to any sports participation. The mean proportion and 95% CI data from individual studies in addition to the pooled proportion are presented. Forest plot of rate of return to preinjury sports participation level. The mean proportion and 95% CI data from individual studies in addition to the pooled proportion are presented. Forest plot of rate of return to competitive sports participation. The mean proportion and 95% CI data from individual studies in addition to the pooled proportion are presented. Nine studies reported a mean time between surgery and the resumption of sport of 7.3 (range 2–24) months.50 52 53 66 68 69 71 76 77 The level of sports participation resumed varied among these studies with the time to return to the preinjury sports level, time to return to preoperative sports level, time to resume competition at full capacity, time to resume full physical activity and time to resume sport variously reported. Three studies reported a mean time between surgery and resumption of training or sport-specific activity of 4.1 (range 1–24) months.53 68 71 Daniel et al5 reported the number of hours of sports participation per person per year, and compared preinjury with postoperative participation. The authors reported a mean 274.5 h of postoperative sports participation/person/year, compared with 491 h/person/year prior to injury. The return-to-any-sport rate was 78% (95% CI 59 to 92%) for studies published prior to 2000, and 85% (95% CI 78 to 91%) for studies published after 2000. The rate of return to preinjury level was 62% (95% CI 51 to 72%) for the pre-2000 group and 64% (95% CI 54 to 74%) for the post-2000 group. The rate of return to competitive sport was 44% (95% CI 20 to 69%) for the pre-2000 group compared with 56% (95% CI 43 to 68%) for the post-2000 group, which represented a statistically significant difference (p<0.0001). The return-to-any-sport rate was 81% (95% CI 68 to 92%) for studies with a mean follow-up of 24 months or greater and 83% (95% CI 74 to 91%) for studies with a mean follow-up of less than 24 months. The rate of return to the preinjury level was 62% (95% CI 51 to 72%) for studies with a mean follow-up of 24 months or greater and 66% (95% CI 52 to 79%) for studies with a mean follow-up of less than 24 months, which was statistically significant (p=0.003). The rate of return to competitive sport was 38% (95% CI 28 to 50%) for studies with a mean follow-up of 24 months or greater, compared with 65% (95% CI 39 to 87%) for studies with a mean follow-up of less than 24 months, which was statistically significant (p=<0.0001). Knee laxity was assessed at final follow-up in 37 studies, typically using a knee arthrometer and 30 lb (14 kg) force. Seventeen studies reported mean anterior tibial translation,5 13 44 48 52 55 56 59,–,61 68 71 73 74 77,–,79 with a combined group mean of 1.7 mm side-to-side difference. When the results of the other 20 studies10 45,–,48 50 51 54 58 62,–,65 69 70 80,–,84 were pooled, it was found that 91% of patients had a side-to-side difference in anterior tibial translation of ≤5 mm at final follow-up. Fifteen studies evaluated quadriceps and hamstring strength at final follow-up.13 44 47,–,49 53,–,55 60 62 68 70 72 81 83 The mean limb symmetry index was ≥80% for both knee extensor and flexor peak torque. Twenty-five studies used the IKDC classification to evaluate the functional status of patients' knees at final follow-up.13 26 46 47 50 51 53 54 58,–,60 62 63 65 68 69 71 74 76 78,–,82 84 Eighty-five per cent of patients were reported to have a normal or nearly normal knee (IKDC category A or B). Eleven studies reported hop test results,10 48 51 55 63 71 73 74 77 79 83 with a limb mean symmetry index of 98%. Twelve studies presented data regarding reasons for changing sport participation level for people who did not return to their previous sports level following surgery.10 12 44 45 54 56 62 78 81,–,83 85 Fear of reinjury (19%), problems with the function of the reconstructed knee (13%), reasons other than the reconstructed knee function (18%) such as family commitments or lifestyle change and fear of job loss with reinjury (11%) were the most commonly cited reasons for participants changing or ceasing sports participation postoperatively. Five studies attempted to examine the psychological effects of ACL injury and subsequent surgery on return to sport. The measurement tools used to achieve this purpose were the Psychovitality questionnaire,69 82 the Emotional Responses of Athletes to Injury Questionnaire (ERAIQ),73 the Tampa Scale for Kinesiophobia12 and the ACL Return to Sport Index (ACL-RSI).57 73 Gobbi and Francisco82 found that athletes who returned to sport following ACL reconstruction scored significantly higher at follow-up on the Psychovitality questionnaire than athletes who did not return to sport, indicating a greater motivation to resume sports participation at the preinjury level. Similarly, Langford et al73 and Webster et al57 found participants who had returned to sport scored significantly higher on the ACL-RSI than those who had not returned indicating a more positive psychological response regarding the resumption of sports participation. No differences were found in ERAIQ scores between participants who had returned to sport postoperatively and those who had not. Kvist et al12 reported that participants who did not return to their preinjury sports participation level scored significantly higher on the Tampa Scale of Kinesiophobia than those who had returned to their preinjury level, indicating they had a greater fear of reinjury. None of the included studies evaluated psychosocial outcome in the immediate postoperative period following ACL reconstruction surgery and subsequently compared the results of those who returned to sport with those that did not return postoperatively. Apart from facilitating a return to sport following ACL injury, ACL reconstruction has also been advocated for patients intending to return to physically demanding occupations, and where recurrent episodes of instability interfere with the performance of activities of daily living.86 87 Thus, for such patients, ACL reconstruction may be warranted regardless of their intentions regarding a return to sport. The medial meniscus, in particular the posterior horn, becomes an important static restraint in the ACL-deficient knee.39 Preservation of the medial meniscus has recently been shown to reduce the risk of the development of osteoarthritis following ACL rupture and subsequent reconstruction.39 It is likely that the mechanism of protection in this instance is in restoring knee joint stability by replacing the native ACL. Therefore, in patients with signs of recurrent instability, ACL reconstruction surgery may be indicated in order to restore stability and minimise potential meniscal trauma. The current review also considered the effect of the year of study publication and length of follow-up on overall return-to-sport rate. Studies published after 2000 were found to have a significantly higher rate of return to competitive sport (56%) when compared with studies published prior to 2000 (44%). This may be due to advances in surgical technique and rehabilitation protocols. The development of minimally invasive surgical techniques, an emphasis on early weight-bearing and accelerated rehabilitation protocols reduce soft-tissue disruption and subsequent postoperative recovery time,88 89 and therefore may be more likely to facilitate a successful return to the higher functional demands placed on the knee by competitive sports participation. Studies reporting a longer follow-up time were hypothesised to report a higher return-to-sport rate as patients had a longer period of postoperative recovery to complete full rehabilitation and return to sports participation. However, studies with a mean follow-up of less than 24 months reported a significantly higher rate of return to preinjury and competitive sports participation levels when compared with studies with a mean follow-up of 24 months or greater. The differences in return-to-sport rates depending on the follow-up time may suggest that while athletes initially return to higher-level sports participation postoperatively, this participation is not maintained long term. It is unclear whether sports participation is not maintained due to reasons related to the function of the operated knee, or for other reasons. As such, further research is required. It should also be noted that a small number of studies had a follow-up of less than 24 months (five studies reported a rate of return to preinjury level at less than 24 months' follow-up compared with 25 studies with greater than 24 months' follow-up, and three studies reported a rate of return to competitive sport at less than 24 months' follow-up compared with 11 studies with greater than 24 months' follow-up). As such, the results of the sensitivity analysis may be skewed, and therefore should be interpreted with caution. The results of the current review reinforce the view that greater emphasis should be placed on the use of participation-based outcomes to assess the effectiveness of ACL reconstruction surgery rather than on impairment-based outcomes. This is in accordance with the work of Ross et al55 that demonstrated the absence of a direct correlation between objective measures of knee function and patient participation in a range of activities including sport, and reflects the recommendations of the World Health Organization that health-outcome measurement adopt the ICF framework.90 Measurement of participation is particularly important, as restrictions to participation in sport or work are likely to be of greater importance to the patient than measurements of impairments such as muscle strength or knee range of motion.91 The results of the current review demonstrate that while approximately 90% of patients achieved normal or nearly normal knee function when assessed postoperatively using impairment-based outcomes, and 85% when activity-based outcomes were used, 56% did not return to competitive sports. For many patients, the use of a specific participation measure such as the ability to return to competitive sport (or at least the preinjury level of sports participation) is appropriate. For others, in particular patients undergoing surgery for reasons other than the intention to return to sport, a participation measure encompassing participation in occupation, leisure pursuits and societal roles may be more appropriate. The discrepancy between return to full physical function and return to sports participation may be indicative of maladaptive psychological functioning postoperatively. Further investigation of the impact of psychosocial factors such as fear of reinjury, motivation, self-efficacy and sports confidence12 57 92 in the immediate postoperative period to predict the ability to successfully return to sports participation postoperatively is required. In addition, the role of psychological interventions as part of the postoperative rehabilitation process has been evaluated little. Current impairment measures may overestimate the success of ACL reconstruction, as they do not evaluate tibial rotation range of motion. Instead, laxity is typically measured by anterior tibial translation. This is important, as previous work has shown excessive tibial rotation during landing and pivoting is not restrained at up to 2 years following ACL reconstruction surgery.93 94 Therefore, there is a need to develop a reliable measure of tibial rotation to determine whether persistent excessive tibial rotation is a contributing factor to a reduced return-to-sport rate. The current review is the first to evaluate the return-to-sport outcome following ACL reconstruction surgery via a systematic review and meta-analysis. The review combines the results of 5770 participants, and as such provides a robust analysis of return-to-sport outcome. The main limitation is that to be included, studies must have reported the number of participants returning to sport at final follow-up. Therefore, studies that evaluated return-to-sport outcome using only activity rating scales such as the Tegner Activity Scale and IKDC sports activity scale were not reviewed, as an accurate return-to-sport rate cannot be determined from these scales. A further limitation was that quality assessment demonstrated that many of the included studies did not compare participants' postoperative sports participation level with their preinjury level. Comparison with the preinjury sports participation level provides an even more robust assessment of the return-to-sport outcome than comparison with presurgery but postinjury sports participation. The results of this review demonstrate that while 82% of patients returned to some form of sports participation following ACL reconstruction surgery, only 44% returned to competitive sport. This was despite approximately 90% achieving a successful surgical outcome in terms of impairment-based measures of knee function, and 85% achieving a successful outcome in terms of activity-based measures. (1) Only about half of patients return to competitive sport after ACL reconstruction surgery. (2) Approximately 90% of patients achieved successful outcomes in terms of impairment-based measures of knee function after ACL reconstruction surgery. This suggests that factors other than knee function could be contributing to return to sport. (3) A better understanding of the role contextual factors (such as fear of reinjury and lifestyle change) play in achieving a successful return to sport after ACL reconstruction is warranted. Anterior cruciate ligament (ACL) reconstruction surgery is a commonly performed procedure, particularly in athletes who want to return to competitive sport following an ACL injury. A previous literature review reported that 56% of patients returned to their preinjury level of sports participation following ACL reconstruction surgery. This study combines the results of over 5500 participants and presents information on the rate of return to any form of sport, the preinjury and competitive level using a meta-analysis. The results showed that approximately 63% of people returned to their preinjury sports participation level, while 44% returned to competitive sport.
. Patellar tendon versus hamstring autograft for anterior cruciate ligament rupture in adults. Cochrane Database Syst Rev 2006;2:1–13.
. Anterior instability of the knee despite an intensive rehabilitation program. Clin Orthop Relat Res 1996:328:159–64.
. Computer assisted surgery for knee ligament reconstruction. Cochrane Database Syst Rev 2009;1:1–8.
. Non-contact anterior cruciate ligament injuries: risk factors and prevention strategies. J Am Acad Orthop Surg 2000;8:141–50.
. Fate of the ACL-injured patient: a prospective outcome study. Am J Sports Med 1994;22:632–44.
. Endoscopic reconstruction for isolated anterior cruciate ligament rupture. J Bone Joint Surg Br 1998;80:288–94.
. Soccer after anterior cruciate ligament injury—an incompatible combination? A national survey of incidence and risk factors and a 7-year follow-up of 310 players. Acta Orthop Scand 1995;66:107–12. Soft tissue problems of the knee. In: Baratz ME, Watson AD, Imbriglia JE eds. Orthopaedic Surgery: The Essentials. New York: Thieme Medical Publishers 1999:551–60.
. Anatomy and biomechanics of the anterior cruciate ligament. In: Prodromos CC, ed. The Anterior Cruciate Ligament: Reconstruction and Basic Science. Philadelphia, Philadelphia: Saunders: Elsevier 2008:3–11.
. Clinical, functional and radiologic outcome in team handball players 6 to 11 years after anterior cruciate ligament injury: a follow up study. Am J Sports Med 2003;31:981–9.
. Rehabilitation following anterior cruciate ligament injury: current recommendations for sports participation. Sports Med 2004;34:269–80.
. Fear of re-injury: a hindrance for returning to sports after anterior cruciate ligament reconstruction. Knee Surg Sports Traumatol Arthrosc 2005;13:393–7.
. A randomized comparison of patellar tendon and hamstring tendon anterior cruciate ligament reconstruction. Am J Sports Med 2003;31:564–73.
. Arthroscopic reconstruction of the anterior cruciate ligament: a comparison of patellar tendon autograft and four-strand hamstring tendon autograft. Am J Sports Med 1999;27:444–54.
. Linking health-status measurements to the International Classification of Functioning, Disability and Health. Am J Phys Med Rehabil 2002;34:205–10.
. Revision anterior cruciate ligament surgery. Clin Sports Med 1999;18:109–71.
. Methodological index for non-randomized studies (minors): development and validation of a new instrument. ANZ J Surg 2003;73:712–16.
. Conducting the review: Study quality assessment. Undertaking Systematic Reviews on Effectiveness: CRD's Guidance for those Carrying out or Commissioning Reviews. NHS Centre for Reviews and Dissemination: Univerity of York. 2001.
. Tools for assessing quality and susceptibility to bias in observational studies in epidemiology: a systematic review and annotated bibliography. 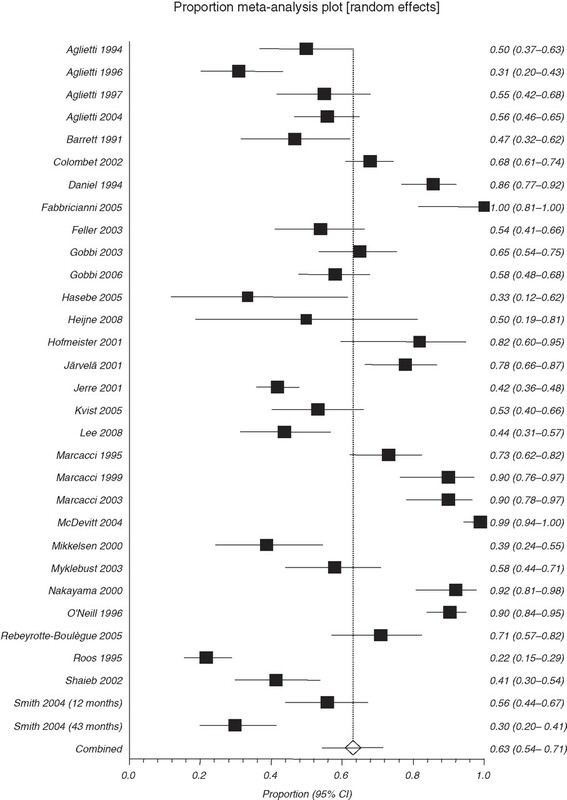 Int J Epidemiol 2007;36:666–76.
. Fixed- and random-effects models in meta-analysis. Psychol Methods 1998;3:486–504.
. Approaches to heterogeneity in meta-analysis. Stat Med 2001;20:3625–33.
. Determinants of patient satisfaction with outcome after anterior cruciate ligament reconstruction. J Bone Joint Surg Am 2002;84-A:1560–72.
. Rehabilitation after anterior cruciate ligament reconstruction: a prospective, randomized, double-blind comparison of programs administered over 2 different time intervals. Am J Sports Med 2005;33:347–59.
. An early return to vigorous activity may destabilize anterior cruciate ligaments reconstructed with hamstring grafts. Arch Phys Med Rehabil 2004;85:298–302.
. The effect of early versus late return to vigorous activities on the outcome of anterior cruciate ligament reconstruction. Am J Sports Med 1993;21:243–8.
. A prospective, randomized study of three operations for acute rupture of the anterior cruciate ligament. Five-year follow-up of one hundred and thirty-one patients. J Bone Joint Surg Am 1996;78:159–68.
. Brace-free rehabilitation, with early return to activity, for knees reconstructed with a double-looped semitendinosus and gracilis graft. J Bone Joint Surg Am 1996;78:814–25.
. Relationships between objective assessment of ligament stability and subjective assessment of symptoms and function after anterior cruciate ligament reconstruction. Am J Sports Med 2004;32:629–34.
. Effects of an accelerated rehabilitation program after anterior cruciate ligament reconstruction with combined semitendinosus-gracilis autograft and a ligament augmentation device. Am J Sports Med 1995;23:588–92.
. Five-year results of single-incision arthroscopic anterior cruciate ligament reconstruction with patellar tendon autograft. Am J Sports Med 1998;26:181–8.
. Arthroscopic anterior cruciate ligament reconstruction with the patellar tendon for chronic laxity: follow-up of 69 cases. J Sport Traumatol 1997;19:198–207.
. Bone mineral density in the proximal tibia and calcaneus before and after arthroscopic reconstruction of the anterior cruciate ligament. Arthroscopy 2006;22:265–9.
. Effect of anterior cruciate ligament injury and reconstruction on proprioceptive acuity of knee rotation in the transverse plane. Am J Sports Med 2009;37:1618–26.
. Clinical comparison between six-stranded hamstring tendon and patellar tendon autograft in arthroscopic anterior cruciate ligament reconstruction: a prospective randomized clinical trial. J Med Assoc Thai 2009;92:491–7.
. Osteoarthritis in patients with anterior cruciate ligament rupture: a review of risk factors. Knee 2009;16:239–44.
. Isolated total ruptures of the anterior cruciate ligament–a clinical study with long-term follow-up of 7 years. Scand J Med Sci Sports 1999;9:114–19.
. Factors affecting outcome after anterior cruciate ligament injury: a prospective study with a six-year follow-up. Scand J Med Sci Sports 2008;18:318–24.
. Primary surgical treatment of anterior cruciate ligament lesions. Am J Sports Med 1982;10:103–7.
. The effect of initiating a preventive multimodal analgesic regimen on long-term patient outcomes for outpatient anterior cruciate ligament reconstruction surgery. Anesth Analg 2007;105:228–32.
. Patellar tendon versus doubled semitendinosus and gracilis tendons for anterior cruciate ligament reconstruction. Am J Sports Med 1994;22:211–17; discussion 217–18.
. MacIntosh–Jones reconstruction for the unstable knee. Injury 1991;22:282–6.
. Endoscopic reconstruction of the anterior cruciate ligament with an ipsilateral patellar tendon autograft. A prospective longitudinal five-year study. J Bone Joint Surg Br 2000;82:984–91.
. Anterior cruciate ligament reconstruction with doubled semitendinosus and gracilis tendon graft in rugby players. Knee Surg Sports Traumatol Arthrosc 2005;13:2–7.
. Anterior-cruciate-ligament reconstruction using doubled hamstring-tendon autograft. J Sport Rehabil 2005;14:279–93.
. Decrease of knee flexion torque in patients with ACL reconstruction: combined analysis of the architecture and function of the knee flexor muscles. Knee Surg Sports Traumatol Arthrosc 2006;14:310–17.
. Early versus late reconstruction for anterior cruciate ligament rupture. Results after five years of follow up. Am J Sports Med 1995;23:690–3.
. Functional bracing after anterior cruciate ligament reconstruction: a prospective, randomized, multicenter study. Am J Sports Med 2004;32:1887–92.
. Closed kinetic chain alone compared to combined open and closed kinetic chain exercises for quadriceps strengthening after anterior cruciate ligament reconstruction with respect to return to sports: a prospective matched follow-up study. Knee Surg Sports Traumatol Arthrosc 2000;8:337–42.
. Knee functions and a return to sports activity in competitive athletes following anterior cruciate ligament reconstruction. J Nippon Med Sch 2000;67:172–6.
. Isokinetic evaluation of anterior cruciate ligament reconstruction using a free fascia lata graft strengthened by gracilis tendon. Isokinet Exerc Sci 2005;13:20–4.
. A prospective randomized comparison of patellar tendon versus semitendinosus and gracilis tendon autografts for anterior cruciate ligament reconstruction. Am J Sports Med 2002;30:214–20.
. Development and preliminary validation of a scale to measure the psychological impact of returning to sport following anterior cruciate ligament reconstruction surgery. Phys Ther Sport 2008;9:9–15.
. Anterior cruciate ligament reconstruction in patients with or without accompanying injuries: A re-examination of subjects 5 to 9 years after reconstruction. Arthroscopy 2001;17:818–25.
. Intra- and extra-articular anterior cruciate ligament reconstruction utilizing autogeneous semitendinosus and gracilis tendons: 5-year clinical results. Knee Surg Sports Traumatol Arthrosc 2003;11:2–8.
. Arthroscopic intra and extra articular ACL reconstruction with gracilis and semitendinosus tendons with early resumption of sport. Results at minimum two years follow-up. Knee 1999;6:25–32.
. Anterior cruciate ligament reconstruction with alternative tibial tunnel: early results after accelerated weight-bearing. Knee Surg Sports Traumatol Arthrosc 1998;6:220–3.
. A comparison between patellar tendon and doubled semitendinosus/gracilis tendon for anterior cruciate ligament reconstruction. A minimum five-year follow-up. J Sports Traumatol Relat Res 1997;19:57–68.
. Results of anterior cruciate ligament reconstruction in the adolescent female. J Pediatr Orthop 2001;21:302–6.
. Anterior cruciate ligament reconstruction with autogenous patellar tendon graft in patients with articular cartilage damage. Am J Sports Med 1997;25:626–34.
. Arthroscopically assisted reconstruction of the anterior cruciate ligament. A prospective randomized analysis of three techniques. J Bone Joint Surg Am 1996;78:803–13.
. Reconstruction of the anterior cruciate ligament. A 5-year follow-up of 89 patients. Acta Orthop Scand 1988;59:288–93.
. Assessment of quadriceps/hamstring strength, knee ligament stability, functional and sports activity levels five years after anterior cruciate ligament reconstruction. Am J Sports Med 1988;16:170–80.
. Anterior cruciate ligament reconstruction with autogenous patellar tendon graft followed by accelerated rehabilitation: a two- to nine-year follow up. Am J Sports Med 1997;25:786–95.
. ST/G ACL reconstruction: double strand plus extra-articular sling vs double bundle, randomized study at 3-year follow-up. Scand J Med Sci Sports 2008;18:573–81.
. No benefit of bracing on the early outcome after anterior cruciate ligament reconstruction. Knee Surg Sports Traumatol Arthrosc 1998;6:88–92.
. Reconstruction of anterior cruciate ligament deficient knees in soccer players with an iliotibial band autograft. A prospective study of 132 reconstructed knees followed for 4 (2–7) years. Scand J Med Sci Sports 2001;11:16–22.
. Reconstruction of chronic anterior cruciate ligament insufficiency in athletes using a bone–patellar tendon–bone autograft. A two-year follow up study. Int Orthop 1995;19:1–6.
. A prospective longitudinal study to assess psychological changes following anterior cruciate ligament reconstruction surgery. Br J Sports Med 2009;43:377–8.
. Rehabilitation and recovery after anterior cruciate ligament reconstruction: patients' experiences. Scand J Med Sci Sports 2008;18:325–35.
. Anterior cruciate ligament reconstruction using four-strand semitendinosus and gracilis tendon grafts and metal interference screw fixation. Arthroscopy 2002;18:232–7.
. Primary anterior cruciate ligament reconstruction using the contralateral autogenous patellar tendon. Am J Sports Med 2000;28:651–8.
. Return to sports after anterior cruciate ligament reconstruction—a review of patients with minimum 5-year follow-up. Ann Acad Med Singap 2008;37:273–8.
. A comparison of results after arthroscopic anterior cruciate ligament reconstruction in female and male competitive athletes. A two- to five-year follow-up of 429 patients. Scand J Med Sci Sports 1999;9:290–5.
. Arthroscopically assisted semitendinosus and gracilis tendon graft in reconstruction for acute anterior cruciate ligament injuries in athletes. Am J Sports Med 1996;24:726–31.
. Anterior cruciate ligament reconstruction: Bone-patellar tendon-bone compared with double semitendinosus and gracilis tendon grafts—A prospective, randomized clinical trial. J Bone Joint Surg Am 2004;86-A:2143–55.
. Factors affecting return to sports after anterior cruciate ligament reconstruction with patellar tendon and hamstring graft: a prospective clinical evaluation. Knee Surg Sports Traumatol Arthrosc 2006;14:1021–8.
. Quadrupled bone-semitendinosus anterior cruciate ligament reconstruction: a clinical investigation in a group of athletes. Arthroscopy 2003;19:691–9.
. Clinical evaluation of arthroscopically assisted anterior cruciate ligament reconstruction: patellar tendon versus gracilis and semitendinosus autograft. Arthroscopy 2005;21:412–17.
. Subjective functional assessments and the return to competitive sport after anterior cruciate ligament reconstruction. Br J Sports Med 2004;38:279–84. Double-bundle ACL reconstruction technique. In: Fu FH, Cohen SB eds. Current Concepts in ACL Reconstruction. Thorofare, NJ: Slack Incorporated 2008.
. Beliefs and attitudes of members of the American Academy of Orthopaedic Surgeons regarding the treatment of anterior cruciate ligament injury. Arthroscopy 2003;19:762–70.
. Return to play after anterior cruciate ligament reconstruction. Clin Sports Med 2004;23:395–408, ix.
. Operative and non-operative rehabilitation of the ACL-injured knee. Sports Med Arthrosc 1996;4:69–82.
. International classification of functioning, disability and health: a promising framework and classification for rehabilitation medicine. Am J Phys Med Rehabil 2005;84:733–40.
. The Participation Scale: measuring a key concept in public health. Disabil Rehabil 2006;28:193–203.
. Fear of re-injury, negative affect, and catastrophizing predicting return to sport in recreational athletes with anterior cruciate ligament injuries at 1 year postsurgery. Rehabil Psychol 2007;52:74–81.
. Excessive tibial rotation during high-demand activities is not restored by anterior cruciate ligament reconstruction. Arthroscopy 2005;21:1323–9.
. Follow-up evaluation 2 years after ACL reconstruction with bone–patellar tendon–bone graft shows that excessive tibial rotation persists. Clin J Sport Med 2006;16:111–16.